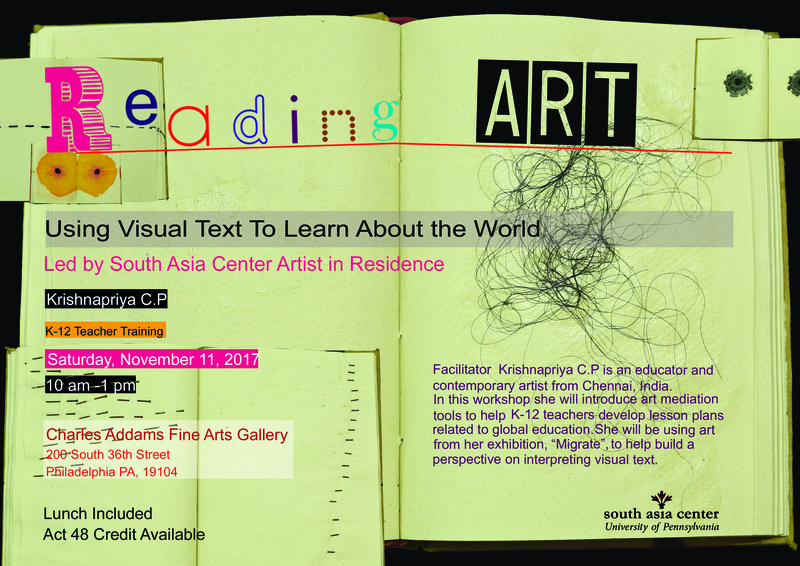 Facilitator C.P Krishnapriya is an educator and contemporary artist from Chennai, India. In this workshop, she will introduce art mediation tools to help K-12 teachers develop lesson plans related to global education. She will be using art from her exhibition, “Migrate”, to help build perspective on interpreting visual text. This interactive workshop will take place on Saturday, November 11, 2017 10:00am to 1:00pm at the Charles Addams Fine Arts Gallery located at 200 S 36th St, Philadelphia, PA 19104. ACT 48 Credit Available. Lunch included. Limited capacity, RSVP today! RSVP Required. Learn more about the SAC Artist Residency here. Learn more about the “Migrate”, exhibition opening reception and artist talk (Thursday, October 26, 2017 @ 5PM) here.